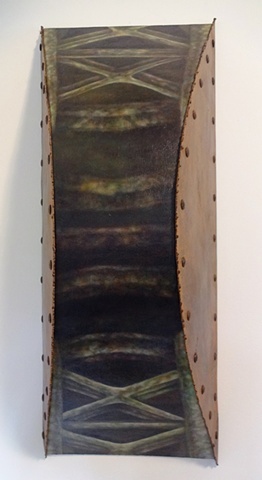 28" X 11" X 8"
This three-dimensional canvas was built with wood before stretching the canvas. The painting is framed with rusted metal and bolts that appear to be rivets on the sides. I loved riding my bicycle in the park where Fort Snelling resides in south Minneapolis, underneath the Mendota Bridge.